Air Hose Reels – Reelcraft Industries, Inc. The majority of air hose reels refer to the type that are designed to house air hosing, which is typically small in diameter. Air hoses are especially helpful in industrial settings when pneumatic power must be transported some distance, especially if the source, such as an industrial air compressor, is too large to be moved. While the transport applications of air hose reels are wide-ranging, they are not the only applications of air hose reels. Air hose reels are also advantageous for storage applications in order to ensure that the hose stays wrapped neatly around the reel rather than on the floor, preventing safety hazards and maximizing efficiency. Air hose reels are widely used in the automotive, manufacturing, and construction industries as well as in personal residences for various maintenance projects. Air hose reels are typically manufactured from materials such as metal, fiberglass, or plastic. Of these materials the most common are which are likely steel, stainless steel, galvanized steel, aluminum and polyethylene. In addition, there are two main types of air hose reels: storage and continuous-flow. A storage reel is meant purely for storage while the hose is not in use. 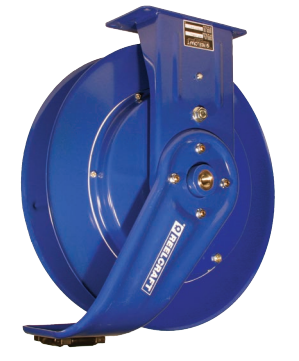 Continuous flow reels are designed so that the hose can be used while remaining wound around the reel. In addition to these two central types of designs, air hose reels also can have a variety of design features, such as different retractable options. While there are a wide range of retraction methods, they are principally divided into manual and mechanical hose reels. Manual hose reels require physical winding by way of a handle. Mechanical hose reels utilize electric, spring, or pneumatic power to do the majority of the work of winding or unwinding the hose. 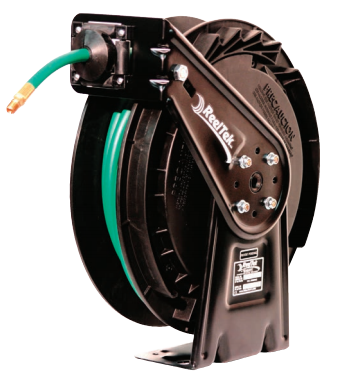 A spring-driven air hose reel is designed in a slightly different fashion than other mechanical retraction options because the spring motor must often be hermetically sealed in order to completely isolate it from both dirt and moisture. Air Hose Reels An air hose reel, also known as a pneumatic hose reel, can refer to two types of hose reels: one, a hose reel that is used to convey air, and two, a hose reel that utilizes pneumatic power in order to wind and unwind the hosing. A hose reel is a cylindrical device around which a variety of hoses can be manually or mechanically wound.